Limited research has focused on the effect of Lactobacillus on the intestinal toxicity of deoxynivalenol (DON). The present study was conducted to investigate the role of Lactobacillus plantarum (L. plantarum) JM113 in protecting against the intestinal toxicity caused by DON. A total of 144 one-day-old healthy Arbor Acres broilers were randomly distributed into 3 treatments, including the CON (basal diet), the DON (extra 10 mg/kg deoxynivalenol), and the DL (extra 1 × 109 CFU/ kg L. plantarum JM113 based on DON group) treatments. The growth performance, organ indexes, intestinal morphology, pancreatic digestive enzymes, intestinal secreted immunoglobulin A (sIgA), jejunal transcriptome, and intestinal microbiota were evaluated. Compared with the CON and DL groups, the DON supplementation altered intestinal morphology, especially in duodenum and jejunum, where villi were shorter and crypts were deeper (P < 0.05). Meanwhile, the significantly decreased mRNA expression of jejunal claudin-1 and occludin (P < 0.05), ileal rBAT and jejunal GLUT1 of 21-day-old broilers (P < 0.05), as well as duodenal PepT1 and ileal rBAT of 42-day-old broilers were identified in the DON group. Moreover, supplementation with L. plantarum JM113 could increase duodenal expression of IL-10 and IL-12 of 21-day-old broilers, ileal sIgA of 42-day-old broilers, and the bursa of Fabricius index of 21-day-old broilers. Further jejunal transcriptome proved that the genes related to the intestinal absorption and metabolism were significantly reduced in the DON group but a significant increase when supplemented with extra L. plantarum JM113. Furthermore, the bacteria related to nutrient utilization, including the Proteobacteria, Escherichia, Cc-115 (P < 0.05), Lactobacillus and Prevotella (P < 0.1) were all decreased in the DON group. By contrast, supplementation with L. plantarum JM113 increased the relative abundance of beneficial bacterium, including the Bacteroidetes, Roseburia, Anaerofustis, Anaerostipe, and Ruminococcus bromii (P < 0.05). Specifically, the increased abundance of bacteria in the DL group could be proved by the significantly increased caecal content of propionic acid, n-Butyric acid, and total short-chain fatty acid. L. plantarum JM113 enhanced the digestion, absorption, and metabolic functions of the gut when challenged with DON by reducing the injury to intestinal barriers and by increasing the abundance of beneficial bacterium. The trichothecene mycotoxin deoxynivalenol (DON) is commonly found in feedstuff following infestation by the fungus Fusarium [1, 2]. Intestinal epithelial cells are exposed to DON following the ingestion of contaminated diets . Exposure to DON can induce excessive production of free radicals , inhibit protein synthesis , and activate critical cellular kinases involved in signal transduction related to proliferation, differentiation, and apoptosis , which could further induce cytotoxicity and apoptosis, induce gastrointestinal inflammation and necrosis, and disturb the gut barrier . In contrast to the acute effect of DON in humans, piglets, and other mammals, which results in diarrhoea, vomiting, leukocytosis, gastrointestinal haemorrhage and ultimately death [8, 9], the relatively high tolerance of poultry to DON has been attributed to its low bioavailability and effective metabolism . Whereas sub-chronic symptoms including decreased body weight and feed consumption, as well as damage to the intestinal barrier, were also widely identified and worth further study . There are extensive functional interactions between the gut microbiota and host metabolism or immunity [12, 13]. The immune, metabolic, and digestive systems as well as the diet and stress during animal feeding, are all involved in modulating the gut microbiota [14–16]. Recently, it was reported that microbiota is key target for dietary mycotoxins, in which DON was the most documented [17, 18]. The altered microbiota, which in response to feed-derived DON, could contribute to the absorption and utilization of nutrients as well as play a significant part in enhancing body immunity . Herein, we studied the roles of altered microbiota and the alterations in host gene regulation in response to exposure to DON. A number of physical or chemical detoxification systems have been reported to control the adverse effects of mycotoxins in animal production systems [20, 21]. However, the structure of DON prevents the absolute removal or adsorption of DON. In comparison, Lactobacillus is considered to be a good candidate since it can improve intestinal health by stimulating the immune system, modulating gut microbiota, and preventing oxidative damage , thereby eliminating the hazards of DON. The Lactobacillus plantarum (L. plantarum) JM113 strain has high antioxidant activity and thereby supplementation in feed has the potential to protect the integrity of the intestinal barrier in broilers challenged with DON . This study was carried out to evaluate the beneficial effects of L. plantarum JM113 on the intestinal toxicity of DON in broilers. By using the Illumina high-throughput sequencing technique, the altered microbiota and alterations in gene regulation in response to DON challenge as well as the protective effect of L. plantarum JM113 on intestinal function were studied. According to the procedures described by Yang et al. , DON was manufactured by inoculating rice with Fusarium graminearum ACCC 37687 and then was prepared in powder. The contaminated diets were prepared by adding the powder of DON into the feed directly. L. plantarum JM113 was isolated from the intestines of a healthy Chinese Tibetan chicken according to Brisbin et al. . The bacteria was identified by sequencing the V3 region of the 16S rRNA gene and compared with the nonredundant nucleotides in the GenBank database using BLAST, as described in our previous study . Then, L. plantarum JM113 strain was cultured in DeMan, Ragosa and Sharpe (MRS) broth at 37 °C for 24 h. After incubation, culture was centrifuged at 6,000×g for 5 min at 4 °C, after which the pellets were washed with distilled water by centrifuging at 8,000×g for 10 min. The viability of the freeze-dried bacteria was 5 × 1010 CFU/g and was stored at − 80 °C until further use. All the birds and experimental protocols in this study were approved by the Institution Animal Care and Use Committee of the Northwest A&F University (protocol number NWAFAC1008). Based on a single factor experimental design, a total of 144 one-day-old Arbor Acres male broilers (47.89 ± 1.17 g) were randomly assigned to 3 groups with 6 replications and 8 birds per replicate, including 3 treatments: the control (CON) group was supplied with a corn-soybean basal diet, the deoxynivalenol (DON) group was supplied with extra 10 mg/kg deoxynivalenol, and the deoxynivalenol + L. plantarum JM113 (DL) group was supplied with 1 × 109 CFU/ kg L. plantarum JM113 when challenged with 10 mg/kg deoxynivalenol. The basal diet was typical of diets commonly used in the Northwestern District of China to meet the National Research Council (NRC, 1994) recommendations (Additional file 1: Table S1). All birds had ad libitum access to feed and water. In brief, by using a high performance liquid chromatography (HPLC) technique following the method of Yang et al. , the dietary concentration of DON was 0.489 ± 0.085 mg/kg in the starter control feed (1–21 d of age) and 0.456 ± 0.080 mg/kg in the grower control feed (22–42 d of age). Meanwhile, in the DON-contaminated starter and grower feeds, the concentrations of DON were 10.268 ± 0.090 mg/kg and 10.764 ± 0.090 mg/kg, respectively. Moreover, by using plate counting method, the viability of probiotic was greater than 9 × 108 CFU/kg in feed of the DL group and was not detected in feed of the control group. The experiment lasted for 42 d. On d 21 and 42, broilers were weighed, and the feed consumptions were recorded by replication. Average daily weight gain, average daily feed intake, and the ratio of feed to gain were calculated. The samples were respectively gathered at 21 and 42 d of age. For each sampling, one bird from each replicate was randomly selected and weighed after fasting for 12 h. The blood samples were collected and the plasma samples were prepared, followed by euthanasia by exsanguination after intravenous administration of 3% sodium pentobarbital (25 mg/kg body weight; Sigma, USA) and immediately dissected. All efforts were made to minimize the animals’ suffering. Firstly, immune organs (liver, thymus, spleen, and bursa) were collected and weighed immediately. Organ indexes were expressed relative to body weight (g of organ/kg of body weight). Then, by removing the contamination of intestinal contents, the middle complete duodenal, jejunal, and ileal segments with lengths of 3 cm were collected and fixed in 10% buffered formalin for at least 48 h for further histological processing. Next, the duodenal, jejunal, ileal, and caecal content samples; the duodenal, jejunal, and ileal mucosa samples; and the whole pancreas samples were collected into 2 mL Eppendorf tubes and frozen immediately in liquid nitrogen. The duodenal, jejunal, and ileal segments were stored at 4 °C and the other samples were stored at − 80 °C until analyses. The middle complete duodenal, jejunal, and ileal segments which were fixed in 10% buffered formalin, were used for analysis of intestinal morphology. After fixation, fixed samples were dehydrated and cleared. Then, intestinal samples were cut and inserted into cassettes, which were embedded in liquid paraffin. Next, 5 μm paraffin sections were cut using the microtome and stained with haematoxylin-eosin. Villus height and crypt depth were determined using a phase contrast microscope . The activities of pancreatic digestive enzymes, including the amylase, chymotrypsin, and lipase, were measured by spectrophotometric methods according to the manufacturer’s instructions (Jiancheng Biological Engineering Research Institute, Nanjing, China). Moreover, the sIgA content of mucous membrane samples of the duodenum, jejunum, and ileum were measured by enzyme linked immunosorbent assay (ELISA) kits (YuanMu Biological Technology Co. Ltd., Shanghai, China) for chickens. A total of 18 caecal content samples from 42-day-old broilers of 3 different treatments were used for DNA extraction using QIAamp DNA Stool Mini Kit (Qiagen, Germany). The quantity and quality of those 18 DNA samples were further assessed by Nanodrop ND-1000 spectrophotometer (Thermo Scientific, USA) and then stored at − 80 °C until sequencing analysis. 16S rRNA gene amplicons were used to determine the diversity and structural comparisons of the bacterial species in each of these samples using Illumina MiSeq sequencing at Novogene Bioinformatics Technology Co., Ltd., Beijing, China. The PCR amplifications were conducted with the barcoded primer pair that amplifies the V3 + V4 fragments of the 16S rRNA gene . Pyro-sequencing was conducted on an Illumina HiSeq PE250 platform. Paired-end reads were assigned to each sample based on their unique barcode and truncated by cutting off the barcode and primer sequence. After initial trimming, the merged reads were obtained with FLASH v1.2.7 (http://ccb.jhu.edu/software/FLASH/) based on overlapping regions within the paired-end reads , and the splicing sequences were called raw tags. Quality filtering on the raw tags was performed according to the QIIME (V1.7.0, http://qiime.org/index.html) quality control process , and all sequences shorter than 2,000 bp in length and having a quality score lower than 25 in the raw reads were removed. The chimaera sequences were also removed through the UCHIME algorithm (http://www.drive5.com/usearch/manual/uchime_algo.html) and the Gold database (http://drive5.com/uchime/uchime_download.html) [29, 30]. Finally, the high-quality clean tags were obtained. These sequences were classified into the same operational taxonomic units (OTUs) at an identity threshold of 97% similarity using UPARSE software (UPARSE v7.0.1001, http://drive5.com/uparse/) . For each OTU, a representative sequence was screened and used to assign taxonomic composition using the RDP Classifier (Version 2.2, http://sourceforge.net/projects/rdp-classifier/) and the Green Gene database (http://greengenes.lbl.gov/cgi-bin/nph-index.cgi) [32, 33]. The taxon abundance of each sample was separated into the phylum, class, order, family, and genera levels. The MetaStat was used to identify the effect of DON on gut microbiota and the effect of L. plantarum JM113 on gut microbiota when challenge with DON. Total RNA from 9 jejunal mucous membrane samples (from 3 replications) from 42-day-old broilers were extracted using the TRIzol reagent (Invitrogen, CA, USA). Specifically, DNaseI was used during the RNA isolation process to avoid contamination with genomic DNA. The quantity and purity of total RNA were analyzed by a NanoDrop® ND-1000 spectrophotometer (Thermo Scientific, MA, USA), and the integrity of RNA was assessed with the Bioanalyzer 2100 and RNA Nano6000 LabChip Kit (Agilent, CA, USA). Only samples that had an OD260/280 > 1.8, OD260/230 > 2.0, and a RNA integrity number > 7.0 were used for further sequencing. Approximately 3 μg of total RNA from each sample was used to prepare an mRNA library according to the Illumina® TruSeq™ RNA sample preparation protocol. Then, the paired-end sequencing (2 × 125 bp) was performed on an Illumina Hiseq 2500 at the Novogene Bioinformatics Institute (Beijing, China). Raw data were obtained using CASAVA v1.8+ (Illumina). The index of the reference genome was built using Bowtie v2.2.3  and sequences were aligned to the chicken genome (Gallus gallus 5, Ensembl 85; http://www.ensembl.org/Gallus_gallus/Info/Index) using TopHat . Sequence segments were spliced and annotated, and transcript expressions were calculated by Cufflinks . Fragments per kilobase of exon per million mapped reads (FPKM) was employed to quantify the gene expression . Based on negative binomial distribution, differentially expressed genes (DEGs) were screened out by using DESeq with an adjusted P < 0.05 and fold change > 2 or < 0.5. Gene Ontology (GO) enrichment analysis for the screened DEGs was carried out using the GOseq platform . Kyoto Encyclopedia of Genes and Genomes (KEGG) pathway enrichment analysis for the DEGs was performed by using KOBAS software . P < 0.05 was defined as significantly enriched GO terms or KEGG pathways. Approximately 1 μg of total RNA was reverse transcribed using the PrimeScript™ RT reagent Kit with gDNA eraser (TaKaRa, Dalian, China). qRT-PCR was performed using SYBR® Green PCR Master Mix (TaKaRa, Dalian, China). A 20 μL PCR mixture was quickly prepared. Primers for β-actin (internal control genes) and tested mRNAs were designed using Primer-BLAST (http://www.ncbi.nlm.nih.gov/tools/primer-blast/) and listed in Additional file 1: Table S2. Briefly, the tested mRNAs were included four part: 1) genes which were involved in nutrient transport: PepT1, rBAT, SGLT1, GLUT1, and y+LAT2; 2) genes of intestinal tight junction components: Claudin-1, occludin, and ZO1; 3) genes of cytokines: TNF-α, IFN-γ, IL-10, and IL-12; 4) DEGs selected by RNA sequencing: MST1, CFTR, Fgfl19, PFKFB3, and HBG2. The PCR was conducted in an iCycler iQ5 multicolour real-time PCR detection system (Bio-Rad Laboratories) and programmed as follows: 95 °C for 10 min; 40 cycles of 95 °C for 10 s; 60 °C for 30 s; 72 °C for 30 s; and 72 °C for 5 min. All samples were examined in triplicate. All data were analyzed using the 2−ΔΔCt method . Caecal VFA concentrations were determined via gas chromatography (Agilent 7890A, Agilent Technologies, Santa Clara, CA) according to the procedures described by Shen et al. . The analysis was done by using One-way ANOVA using SPSS 21.0 software with replicates as experiment units and differences were considered to be statistically significant at P < 0.05. Significant differences at the 0.05 level due to treatments were separated by Duncan’s multiple range tests. In 21-day-old broilers, compared with the control group, a significant decrease in duodenal villus height (P < 0.001), increase in duodenal crypt depth (P = 0.012), as well as a decrease in the duodenal ratio of villus height to crypt depth (V:C) (P = 0.001) was detected in the DON group (Table 1). Conversely, chickens exposed to L. plantarum JM113 along with DON showed normal villus length, crypt depth, and normal V:C value of the duodenum when compared with the control group, which showed a significantly increased villus length, decreased crypt depth and an increased duodenal V:C value in the DL group (P < 0.05), when compared with the DON group (Table 1). In 42-day-old broilers, compared with the control group, the significantly decreased duodenal and jejunal villus height (P < 0.001 and P = 0.012) and a significantly decreased jejunal V:C (P = 0.020) were detected in the DON group (Table 1). The DL group also showed normal villus length and normal V:C value when compared with the control group, which also had significantly increased villus length in the duodenum and jejunum as well as increased V:C value of the jejunum in the DL group (P < 0.05) when compared with the DON group (Table 1). The effects of DON and L. plantarum JM113 on the expression of claudin-1, ZO-1, and occludin were investigated. 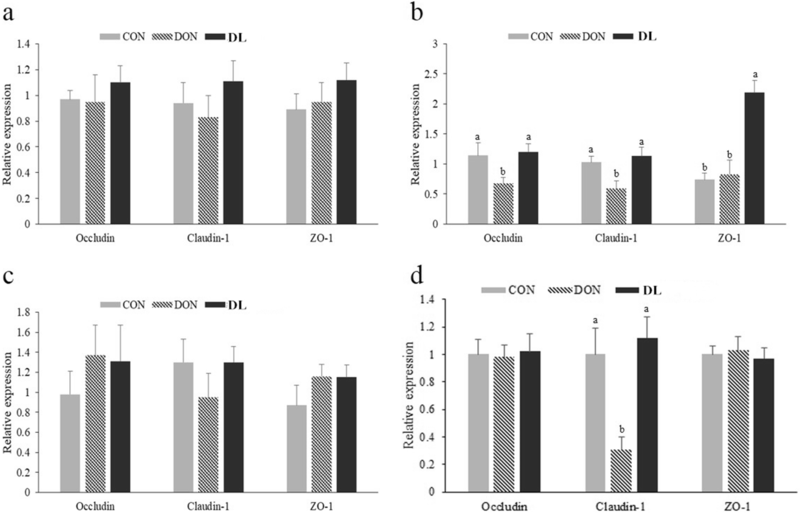 In 21-day-old broilers, DON significantly reduced claudin-1 and occludin mRNA expression in the jejunum (P = 0.044 and P = 0.047, Fig. 1b). However, no effects were found in ZO-1 expression from jejunal (Fig. 1b) mRNA or the mRNA expression of the three tested genes in the duodenum and ileum (Fig. 1a and Fig. 1c). Supplementation with L. plantarum JM113 and DON synchronously could significantly increase jejunal claudin-1 (P = 0.044), occludin (P = 0.047), and ZO-1 (P < 0.001) mRNAs expression when compared with DON challenge group and have a similar expression level as the control group. Specifically, supplementing L. plantarum JM113 with DON significantly increased the ZO-1 mRNA expression when compared with control group. Furthermore, in 42-day-old broilers, a similar significant change was identified in the jejunal claudin-1 mRNAs expression (P < 0.05, Fig. 1d). The sIgA content and the expression of intestinal NF-κB and four cytokines (IL-10, IL-12, TNF-α, and IFN-γ) in the duodenum, jejunum, and ileum of 21-day-old and 42-day-old broilers was also measured. The duodenal expression of IL-10 and IL-12 in the 21-day-old broilers (P = 0.050 and P = 0.045) and the ileal sIgA content of 42-day-old broilers was significantly increased (P = 0.044) in the DL group when compared with the control group (Fig. 2a and h), which indicated that the supplementary L. plantarum JM113 might improve the gut immune function and further counteract the effect of DON on intestinal tissue. However, mRNA expression levels of three other mRNAs were not changed (Fig. 2). The organ indexes of 21-day-old and 42-day-old broilers were also recorded (Table 1). Compared with the control group, the development of the bursa of Fabricius was restrained in the DON group; however, supplying L. plantarum JM113 with DON significantly increased the relative organ index of the bursa of Fabricius (P = 0.016). The intestinal digestion and absorption functions of three groups were further examined. In our study, no significant changes were identified in the growth performance and the pancreatic enzymes, including amylase, chymotrypsin, and lipase (P > 0.05, Additional file 1: Table S3). For the intestinal absorption, the mRNA expression levels of PepT1, rBAT, y+LAT2, GLUT1, and SGLT1 of duodenum, jejunum, and ileum in 21-day-old and 42-day-old broilers were determined. At 21 d of age, the ileal rBAT and jejunal GLUT1, which are responsible for transportation of cationic amino acids and glucose, were significantly reduced in the DON group when compared with the control and DL groups (P = 0.012 and P = 0.007, Fig. 3). 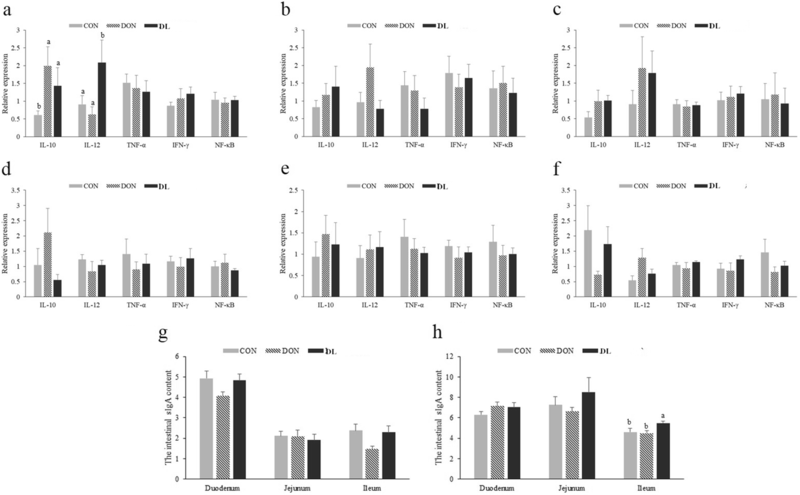 At 42 d of age, compared with the control group, the mRNA expression levels of the duodenal small peptide transporter PepT1 and the ileal amino acid transporter rBAT were also significantly reduced in the DON group but significantly increased in broilers supplied with both DON and L. plantarum JM113 (P = 0.013 and P = 0.041, Fig. 3). In this study, the damaging effects of DON and the regulatory roles of L. plantarum JM113 mainly occurred in jejunum. To clarify the gene-network that was involved in the damaging effects of DON and the beneficial effects of L. plantarum JM113, further RNA sequencing was performed. Comparing between the control and DON treatments, a total of 21 up-regulated mRNAs and 28 down-regulated mRNAs were identified in the DON group (Additional file 1: Table S4). GO enrichments of the DEGs were categorized into 85 functional annotations that met the criteria of P < 0.05 (Additional file 1: Table S5). The results indicated that the treatment with DON induced several adverse effects including an alteration of gut integrity and the induction of an inflammatory response, including the heterotypic cell-cell adhesion, actin-mediated cell contraction, cell-cell adherens junction, and the regulation of anoikis. Specifically, the anoikis process was usually accompanied by small intestine cell shedding , which indicated that DON could actually have induced intestinal injury and that anoikis pathway could serve as the most important apoptotic process in the small intestinal epithelium when challenged with DON. Moreover, several biological process related to transmembrane transport and metabolism of nutrients were identified based on the DEGs, including the transport of monocarboxylic acid, organic acid, and lactate; the metabolism of glucose, ketone, thioester and nitrogen; and the biosynthesis of acetyl-CoA and fatty acid. Then, further KEGG analyses revealed that these mRNAs were significantly involved in 2 pathways, including glycosaminoglycan biosynthesis - keratan sulfate, and the nitrogen metabolism. To illuminate the roles of L. plantarum JM113 in regulating gene expression, which could counteract the effect of DON on intestinal tissue, the comparison between the DL and DON treatments were further analyzed. 92 DEGs were identified (Additional file 1: Table S6), of these, 51 mRNAs were increased and 41 mRNAs were decreased in the DL group when compared with the DON group. GO and KEGG analyses were also performed and the results indicated that many of the altered genes were significantly categorized into 76 GO terms and 2 KEGG pathway (Additional file 1: Table S7). Accordingly, most of the GO terms were related to the regulation of intestinal epithelial integrity and the transmembrane transport of nutrients. Meanwhile, the significantly enriched KEGG pathways were related to phenylalanine, tyrosine and tryptophan biosynthesis, and the glycerophospholipid metabolism process. Five of these DEGs were further verified by qRT-PCR and the results indicated that the expression of our selected mRNAs detected by qRT-PCR were consistent with the mRNA-sequencing data (Fig. 4). Caecal microbiota has the most abundant microbiota in the broilers’ gut and could actually represent the whole gut microbiota of chickens [42–44]. To investigate the effect of DON on gut microbiota, the significantly altered intestinal microflora at the phylum, genus, and species levels were also analyzed statistically (Table 2). At the phylum level, the abundance of Proteobacteria was found to be significantly reduced in the DON supplemented group (P < 0.05). At the genus level, Escherichia and Cc-115 were significantly reduced in the DON group (P < 0.05), and Lactobacillus and Prevotella both tended to be reduced by DON (P < 0.1). Moreover, at the species level, Escherichia coli was the only significantly altered bacteria (P < 0.05); meanwhile, Ruminococcus bromii, Desulfovibrio C21_c20, and Eubacterium dolichum all tended to be reduced by treatment with DON (P < 0.1). To examine the regulatory roles of L. plantarum JM113, the significant alterations of the caecal microbiota between the DON and DL groups were also statistically analyzed based on the phylum, genus, and species (Table 3). At the phylum level, the abundance of Bacteroidetes and Firmicutes were found to be significantly altered (P < 0.05), of these, Bacteroidetes was significantly increased and Firmicutes was significantly decreased in the DL group when compared with the DON group. At the genus levels, the relative abundance of Roseburia, Anaerofustis, Anaerostipe were significantly increased in the DL group (P < 0.05). The Ruminococcus bromii was significantly altered at the species levels in the present study (P < 0.05). Compared with the control and DON groups, the content of propionic acid, n-Butyric acid, and total short-chain fatty acid (SCFA) were all significantly increased in the DL group (P < 0.05), although no significant alterations were determined between the control and DON groups (Table 4). Meanwhile, other SCFAs, including acetic acid, isobutyric acid, isopentanoic acid, and n-Pentanoic acid, were not significantly altered among the control, DON, and DL groups (Table 4). The damages to the intestinal histological morphology and gut integrity, and the changes in the inflammatory responses and the intestinal absorption of the amino acid, glucose, and small peptide were all identified in the present study when broilers were challenged with DON, which were widely proved by previous studies [45–49]. Strategies to alleviate the harmful effects of DON are of increasing interest and need to take into account the potential causes of the negative effects of DON contamination on poultry. One of the many strategies to counteract the harmful effects of DON is the addition of probiotics [50, 51]. Lactobacillus, which improves performance, promotes the digestion and utilization, and prevents intestinal epithelial barrier dysfunction and immune responses, could be used to alleviate the harmful effects of DON [52–55]. Nevertheless, the magnitude of the effect seems to be strain dependent and host specific. L. plantarum JM113, which proved to have the antioxidant activities in vivo and in vitro , could improve the antioxidant status and protect the integrity of the intestinal barrier in broiler chickens fed diet supplemented with DON. In the present study, extra addition of L. plantarum JM113 can counteract the adverse effects of DON-induced damages on the intestine, as seen by the restored villus length and V: C value, and the restored intestinal tight junctions such as the mRNAs expression of claudin-1, occludin, and ZO-1, which were in accordance with our previous study . To sum up, the results of the present study and our previous study  have demonstrated that addition of L. plantarum JM113 improved the antioxidant status and protected the integrity of the intestinal barrier in broiler chickens fed diet supplemented with DON. Meanwhile, the restored absorption functions of the amino acid, glucose, and small peptide and the improved transmembrane transport and metabolism of phenylalanine, tyrosine, tryptophan, and glycerophospholipid, which were concluded from the qRT-PCR and the bioinformatics analysis of RNA sequencing, were also identified in the DL group. In the previous studies, the lipid metabolism and the phenylalanine, tyrosine and tryptophan metabolism were proved to be disturbed by DON contamination [5, 49, 56]. Hence, our results indicated that L. plantarum JM113 could improve the digestion, absorption, and metabolic functions of jejunum, especially the metabolism of lipid and amino acids, to counteract the disadvantageous effects of DON. Previous study speculated that probiotics improve the metabolic processes due to the increased microvilli height leading to an increase in the microvilli’s absorptive surface area and enabling the optimal utilization of nutrients . However, this viewpoint ignored the role of probiotics in regulating the intestinal microbiota. Specifically, our previous study had proved that L. plantarum JM113 could effectively inhibit growth of 3 pathogens (Escherichia coli, Salmonella enteritidis, and Salmonella typhimurium) [22, 24], which indicated that the altered microbiota induced by L. plantarum JM113 could serve as the mechanism of L. plantarum JM113 on the protection of the intestinal digestion, absorption, and metabolic function of broiler when challenged with DON. Hence, the most important focus of the present study was on the significantly altered microbiota, which was in response to DON contamination and the protective roles of L. plantarum JM113. The alterations of gut microbiota, which was induced by the feed-derived DON, were firstly studied. The abundance of Proteobacteria (phylum level), the Escherichia, Cc-115, Lactobacillus and Prevotella (genus level), as well as the Escherichia coli, Ruminococcus bromii, Desulfovibrio C21_c20, and Eubacterium dolichum (species level) were all found to be reduced by DON contamination. Among these different bacteria, the presence of Proteobacteria was favoured by an animal protein-based diet and it plays a crucial role in improving the digestibility of protein in the gut [58, 59]. The Cc-115 belongs to Erysipelotrichaceae, which have been proved to take part in the digestibility of lipid and the formation of short chain fatty acids, including acetate, propionate, and butyrate [60, 61]. The abundance of Prevotella was positively related to the degradation of oligose, xylan, protein, and starch . The abundance of Lactobacillus was proved to take part in the degradation of lipid and lactose and enhance the intestinal immune function [22, 63, 64]. Ruminococcus bromii was a keystone species for the degradation of resistant starch, which indicated that it was beneficial for the degradation of starch, reduction of chyme viscosity, and improvement in the digestibility of other nutrients [65, 66]. In conclusion, these bacteria were beneficial for improving the digestion and absorption of nutrients and were all significantly decreased by DON contamination, which indicated that DON contamination was harmful for the digestion and absorption of nutrients by influencing the abundance of these bacteria. Meanwhile, by qRT-PCR and RNA sequencing, we have proved that the digestion and absorption of amino acid, glucose, small peptide, monocarboxylic acid, organic acid, lactate, ketone, and lipid were all damaged by DON contamination, which is in accordance with the alterations in the gut microbiota. Herein, our results indicated that DON contamination could reduce the abundance of intestinal beneficial bacteria, which were beneficial for the digestion and absorption of nutrients and further influence the digestion, absorption, and metabolism of amino acids, glucose, and lipid. As shown by previous studies, the main function of L. plantarum was regulating the gut microbiota and further enhancing the intestinal digestive function [52–55]. The significantly altered microbiota between the DON and DL groups were further identified. At the phylum level, Bacteroidetes was significantly increased in the DL group when compared with the DON group. The bacteria of Bacteroidetes play a fundamental role in the processing of complex molecules to simpler ones, and the increased Bacteroidetes in the gut of broilers have been proved to be positively correlated with increased growth performance [67, 68]. At the genus level, the relative abundance of Roseburia, Anaerofustis, and Anaerostipe were significantly increased in the DL group. Roseburia and Anaerostipe produce butyric acid by fermentation of carbohydrates, which enables a significant increase in intestinal carbohydrate absorption and energy utilization efficiency in gut [69, 70]. Ruminococcus bromi have been shown to assist in the degradation of resistant starches and other nutrients [65, 66], and were significantly increased in the DL group when compared with the DON group and significantly decreased in the DON group when compared with the control group. Overall, our results identified that supplementation with L. plantarum JM113 could increase the abundance of intestinal bacteria that improve digestion and absorption of nutrients and further enhance the digestion, absorption, and metabolism function of gut in broilers when challenged with DON contamination, which have also been observed by qRT-PCR and RNA sequencing. Moreover, determination of volatile fatty acid content has also proved that the content of propionic acid, n-Butyric acid, and total SCFA were all significantly increased in the DL group when compared with the DON group. These results indicate a better nutrient fermentability and digestibility in the DL group, which was caused by the improvement of the gut microbiota. Our results indicated that L. plantarum JM113 could enhance the digestion, absorption, and metabolism functions of gut when challenge with DON contamination in two main ways: by reducing the damages observed in intestinal morphology and intestinal barriers, and by increasing the abundance of beneficial bacterium and regulating the balance of gut microbiota. Shengru Wu and Yanli Liu contributed equally to this work. We want to say thanks to Prof. Xin Zhao from Northwest A&F University for his help to provide materials and methods to obtain the Lactobacillus plantarum JM113. This work was funded by the National Key R&D Program of China (2018YFD0500600 to Xin Yang), National Natural Science Foundation of China (No.31402095 to Xin Yang), the National Key R&D Program of China (2017YFD0500500 to Xiaojun Yang), and the Program for Shaanxi Science & Technology (2017ZDXM-NY-087 to Xin Yang, 2017TSCXL-NY-04-04 to Xiaojun Yang). The authors confirm that all data underlying the findings are fully available without restriction. SRW, XY and XJY conceived and designed the experiments; SRW, YLL and DYL mainly performed the experiments; SRW, YLL and DYL analyzed the data; XY contributed reagents/materials/analysis tools; SRW wrote the manuscript. XY and XJY had primary responsibility for final content. All authors read and approved the final manuscript. All the birds and experimental protocol in this study were approved by the Institution Animal Care and Use Committee of the Northwest A&F University (protocol number NWAFAC1008). Wang H, Ni X, Qing X, Zeng D, Luo M, Liu L, et al. Live probiotic lactobacillus johnsonii bs15 promotes growth performance and lowers fat deposition by improving lipid metabolism, intestinal development, and gut microflora in broilers. Front Microbiol. 2017;8 https://doi.org/10.3389/fmicb.2017.01073.